"Naming where we see crisis can upset us," writes Doughty. "It probably ought to. Distress, at its best, creates awareness. It awakens us to where we are." The Chinese symbol for crisis reflects its dual reality: danger yet opportunity. Even as a crisis threatens, it can bring wholly unanticipated chances for personal and communal growth. At such critical junctures, you want to know you can count on the sound, discerning counsel of genuine leaders—who seem so short in supply right now. Our troubled world needs spiritual leadership now more than ever. 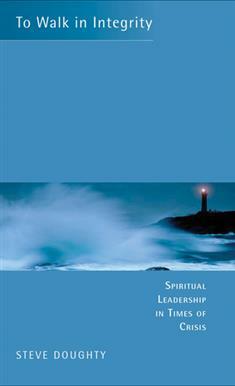 Doughty's To Walk in Integrity provides a model for spiritual leadership in times of crisis. Examining the biblical understanding of integrity, he identifies 9 key qualities. He tells powerful stories of people who acted with integrity in difficult situations despite great personal cost. Each chapter includes guidance for personal meditation and group reflection. Clergy and lay leaders will find inspiration and challenge in this timely book. By examining patterns of daily living and choices, readers not necessarily involved in leadership roles also will be encouraged to follow the practical ingredients for a life of integrity. Each chapter ends with two sets of questions: one for personal reflection and one for group reflection.